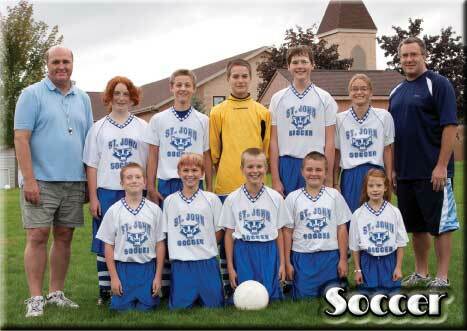 St. John's soccer program is a co-ed activity for children in grades 5 through 8. Ocassionally, younger students from 3rd and 4th grade are allowed to practice with the team. The students learn the fundamentals of the sport from which all the students benefit, younger and older. Soccer starts the first week of school and runs until the first week of October. The team usually competes in two tournaments with schools from surrounding areas, such as Waupaca, Montello, and West Bloomfield.